I was at one of my favourite Japanese restaurant that specialised in Teishoku/Bento where I did a double take when I saw this in their menu. I was scratching my heading what it was until I recalled reading Meepok's recent blog about Lions. Then it dawned on me. 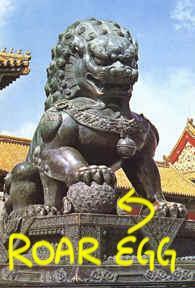 This one confirm lion egg. Don't believe? I got proof one. I show you. hahah, this is funny! I never know you can be so talent! imagine eating it...and it *rooooooooaaaaaaarssssssss*... scary. Spinnee: I thot I say it's Lion Egg already? Spinnee: Remember the "SOLL DOWN" road sign?? Remind me to tell you the Warehouse Supplies joke. Aloe: I have no idea. Must ask people like HiaoAunty who knows japanese one. So did you try that Roar *Raw* egg? Nice bo? Old Beng: Didn't try that as I order the sukiyaki hotpot teishoku instead. HiaoAunty: Then perhaps it is merely the name of the dish and nothing more. 月见...'cuz it looks like a moon? Spinnee: I think we established that it is just a name. Better stop thinking about it before your head explodes. 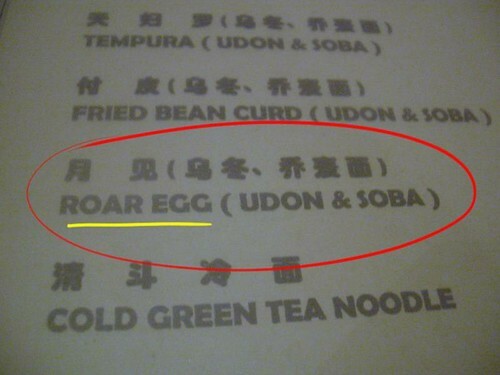 y didnt ask how come its call "RRRrRrroooar Egg "
Yanzzz: In Spitland hor, this type of thing no need to ask one lah. I've learned to not rock the boat and leave things as they are.